We always lean towards offering you the cheapest train tickets Madrid - Malaga. We welcome you to the cheapest train tickets Madrid Malaga, here you will discover how cheap it can be to make the train journey from Madrid to Malaga and you will even learn how to economize the travel time. Break out of the routine and make the trip you want, we offer the cheapest train tickets Madrid - Malaga so that money is not a problem at all. Also for the return, Trains Malaga to Madrid. Although the first trip of the day is at 7:20 h and the last one at 21:20 h, the most appropriate in terms of saving is to choose the departure time at 16:35 h, in this case, we will be entering in Málaga Maria Zambrano at 19:08 h. If what we want is to shorten the time we spend inside the train, the appropriate departure time is the one at 20:35 h, in this way we will be at Málaga Maria Zambrano at 10:49 h. We are on the side of the cheapest train tickets Madrid - Malaga. Trains Malaga with AVE for only 24,10 €. Combining these and other variables, we will find out that the prices for train tickets Madrid - Malaga vary between 24,10 € and 135,40 € and the time to travel the 417 Km of route between Madrid and Malaga swing between 2 hours 24 minutes and 3 hours 5 minutes. We will leave you with your mouth open when booking on Trenes.com your train tickets Madrid - Malaga. The train timetables for trains from Madrid to Malaga on Train Timetables Madrid to Malaga. The search for the train ticket from Madrid to Malaga with the cheapest price was made on the 23/03/2019 a las 16:10 h, it is a AVE train with departure on the 22/04/2019 a las 15:35 h and arrival on the 22/04/2019 a las 18:20 h. The price of the cheapest ticket has been 24,10 € and the cheapest rate with which this price has been possible has been the rate Promo . Trenes.com issues official Tren Madrid Malaga tickets and it does totally legally as a verified and authorised travel agency by Renfe, ie if you buy a Tren Madrid Malaga ticket through our website, you only need to print the ticket or to show the bidi code sent to the mobile phone, present it at the Madrid Atocha station and get on the train you have got assigned. 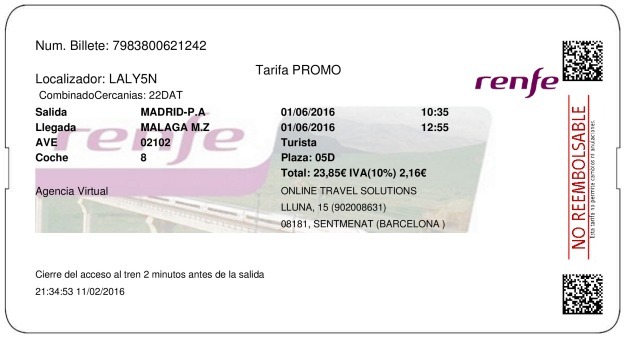 This is a real example of a Madrid Malaga ticket issued by Trenes.com. On it you can see the ticket number 7983800621242, the locator LALY5N, the origin and destination stations, in this case the train travels from Madrid Atocha to Málaga Maria Zambrano. The railway operator Renfe, the train type AVE, the train number 02102 and the rail car 008. The contracted rate Promo in Turista class, the assigned seat 05D, the price for the ticket, this Madrid Malaga train ticket is not necessarily the cheapest ticket since the price of the train ticket often depends on the time in advance with which you bought the ticket. In this case the price is 23,85€ and the departure date is 01/06/2016. The train departure time of this ticket is at 10:35 h and the arrival of this train at the Málaga Maria Zambrano station is at 12:55 h. The duration of the journey from Madrid Atocha to Málaga Maria Zambrano has been 2 horas 20 minutos. There are more options both to save in time and money, to travel in Turista class will save us money, as opposed to doing it in Preferente class, as well as travelling on AVE trains and not doing it instead on AVE trains. If you had already bought your train seats Madrid - Malaga online, you will be amazed at how easy it is with us! If we want to economize on travel time, then we should prefer to travel on AVE trains and not on AVE trains. In short, to save on your train seats Madrid - $destino: travel on AVE trains, choose 8:25 h as departure time and make the travel in claseTrenPrecioMinimo class. If you still hesitate about departure times because the one we suggested doesn't fit the trip to Malaga you have planned, we remind you that the first departure of the day is at 7:20 h, reaching Malaga at 10:05 h, and that the last train from Madrid to Malaga is at 21:20 h, on this schedule we arrive in Malaga at 23:45 h. Things clear and trips by train Madrid - Malaga, cheap. If you still have doubts, try to do it in the schedule in the evening, as well as avoiding to do it in the morning, because in this way you will continue saving on your train tickets Madrid - Malaga. We put all our machinery at your disposal to save on the purchase of train tickets to Malaga. The train tickets to Malaga from Madrid that cost us the minimum amount of 24,10 €, have got a travelling time of 2 hours 33 minutes and the train tickets Madrid Malaga that cost 135,40 € make the route in 2 hours 47 minutes. Let us save you time and money in the booking of your seat in the train Madrid - Malaga. Now you know how and what to save before booking your train tickets Madrid Malaga. 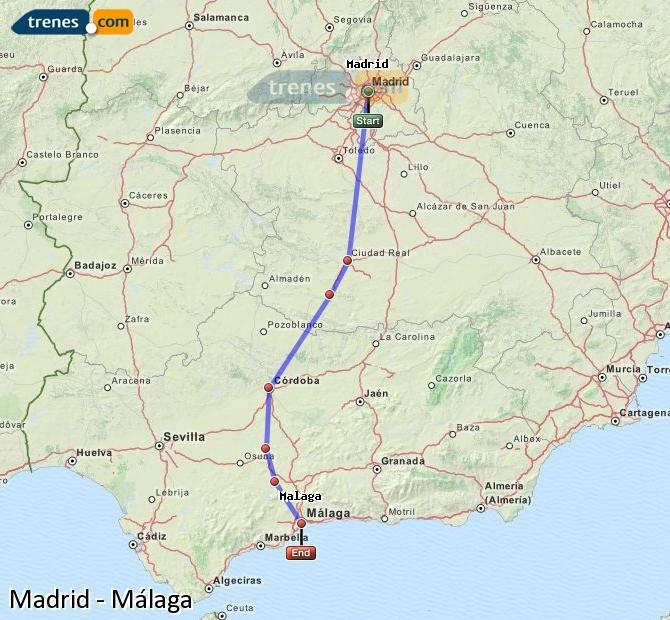 A seat on the train Madrid - Malaga that offers Trenes.com has a maximum price of 135,40 €.